You are here: Home / Recipes / Breakfast / Triple Berry Jam Recipe using No Pectin and No Canning! Triple Berry Jam Recipe using No Pectin and No Canning! There are a few key items that I always keep in my pantry and jam is one of them. Oh, sure…it may be called jelly, preserves, or fruit spread depending on my mood but there is always some kind of spreadable fruit in the house. Not only is it delicious on toast but it is perfect with a bowl of Greek yogurt or on my favorite PB&J sandwich. Homemade jam has always been a bit intimidating for me to make. The whole adding pectin and canning thing just makes it seem like a lot of work. Since fresh berries are incredibly cheap right now, I really wanted to try my hand at making my own jam. I stumbled across a few jam recipes with no pectin and no canning that sounded easy enough. My version of this triple berry jam recipe uses a combination of blueberries, blackberries and strawberries since that is what I had on hand. You can vary the berries used and the ratio depending on your own berry status. This incredibly easy jam recipe is not overly sweet…you can add a bit more sugar if you prefer it sweeter. If you love berries and need more recipes, try these easy mini berry tarts. 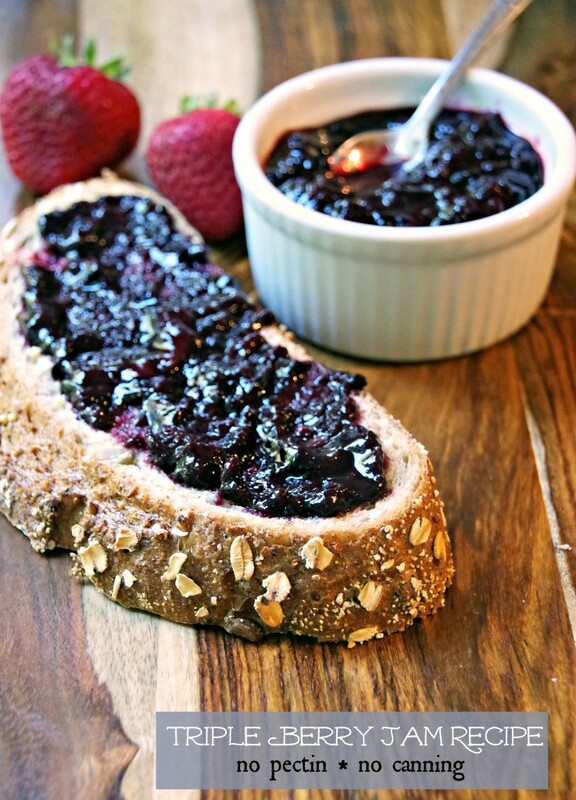 This triple berry jam recipe is incredibly easy to make with no pectin and no canning! Turn down the heat to a simmer and cook uncovered for 60 to 90 minutes. During cooking, use a potato masher to gently break up fruit if you want the jam to be less 'chunky'. When the mixture is done cooking, remove from heat. Add in lemon juice and lemon zest and stir gently. Not sure what to do with your Triple Berry Jam? 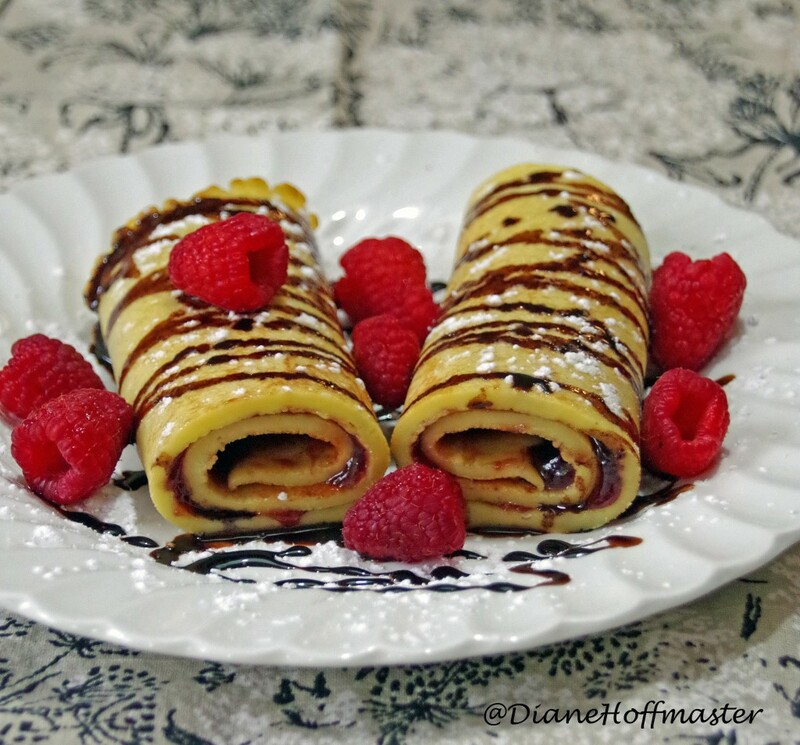 Try these homemade Kaiserschmarrn for breakfast one day! Oh that looks delicious. I love that I don't need pectin to make it! I love jams and this one looks absolutely delicious! The ingredients and simple and it's easy to make. Gotta try this. I love that this doesn't require canning! I've never canned before, but I love jam. I think this would be a great recipe to start with. good luck! Let me know what you think if you give it a try! That sounds fantastic! I love how easy it is to make, too. Thanks for sharing these. I've got to get some triple berry goodness in my life.